There are two easy ways to start a new work order. From the Ascend Desktop, click the Work Order tile. From the Work Orders Due/Ready for Pick-up screen, click the Add button (on the toolbar). On the Enter Serial Number prompt, scan or type the serial number associated with the repair item and click OK. If the serial number was sold through Ascend, the appropriate customer is automatically associated with the work order and repair. If the item doesn’t have a serial number, you’re creating the work order prior to the customer brining the item into the store, or the serial number on the product wasn’t recognized (above), click Cancel, then search for the appropriate customer. If you scanned a recognized serial number, the Customer, Serial #, and Description fields automatically populate. If you only chose the customer, you’ll need to choose or create the repair item. Sherpa Tip: If you're assembling an item for a customer, DO NOT create a new repair item. See How do I assemble a product for a customer? for details. 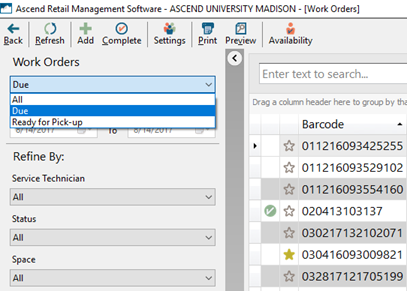 If the product was serialized and sold or previously serviced through Ascend, just click the Description drop-down and choose the appropriate item. If the item doesn’t exist there, click the plus icon to add a new repair item. Enter a meaningful Description (e.g. Trek Skye Purple Lotus 18.5-29 instead of Purple MTB), Serial Number (if applicable), and Where Purchased (if desired). Then click Save. Sherpa Tip: While a repair item is not required, it’s best to enter one for all repairs and service so that the technicians can quickly identify what they’re working on! From the Contact Preferred drop-down, select the customer’s contact preference. When ALL REPAIRS are complete: Do not notify the customer until all repairs (Work Order Details) on the transaction have been completed. When THIS REPAIR is completed: Notify the customer as soon as this repair is completed. In the Call If Over field, enter the maximum amount quoted to the customer for the repair. Technicians should contact the customer for approval if they believe the repair will require more service than quoted. Check Save Old Parts if your store (or the customer) wishes to retain parts removed from the repair item. If the product is new and needs to be put together, check Assemble Item. Scan or enter all required parts and labor/service SKUs. 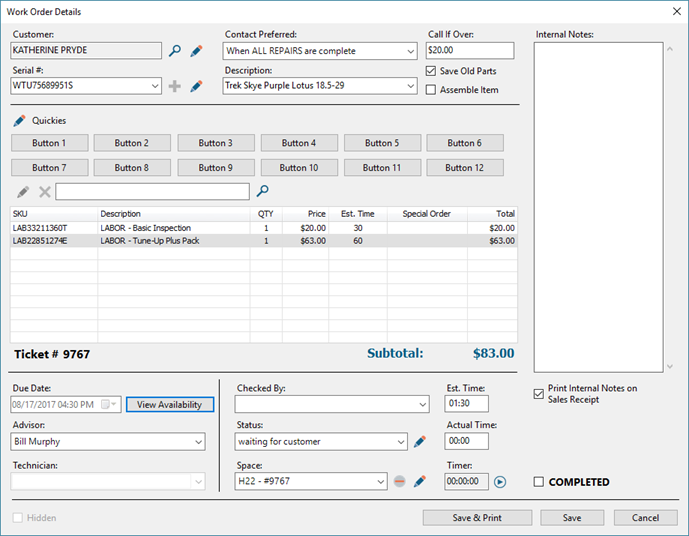 Ticket # automatically populates, and a Subtotal displays all entered items without tax calculated. If you’ve configured Estimated Times for your SKUs, the number of minutes automatically populates in the Est. Time field – this field may also be manually overridden if you feel that the repair will take longer than a standard repair of its type. In Internal Notes, enter as much detail as possible about the customers concerns and expectations. There’s no character limit for this field, so type away! Check Print Internal Notes on Sales Receipt to print this information on both the customer’s receipt and the ticket for the service technicians. If you’re scheduling work orders only by the number your technicians can finish in a day, enter the date and time the customer expects the repair to be done by in the Due Date field. If a specific technician will be working on the repair, select them from the Technician drop-down. The Advisor drop-down automatically populates with the user who created the repair. However, if someone else discussed the initial repair and estimate with the customer, select their name. Select an appropriate status (e.g. Waiting for customer) from the Status drop-down and the location of the repair item in the Space drop-down. Spaces which display in italic orange text are in use on another repair and cannot be selected. Spaces which display in italic blue are in use on a serial number and may be used, if the items are the same. To clear the value from the Space field, click the minus icon next to the field. Click Save & Print to print a copy of the ticket to attached to the repair item. If the customer has more than one repair they’ll be paying for, there’s no need to create multiple transactions. Click the arrow next to the WO Detail button (on the toolbar) and select Add New Work Order Details. You’ll again be prompted for the serial number – scan or enter it if available, or click Cancel. The customer who owns the bike doesn’t need to be the same as the initial customer – if necessary, click the magnifying glass icon next to the Customer field and associate the correct customer. All repair items and tax totals display on the transaction screen. Take payment according to your store’s downpayment policy – but if you’re taking full payment, be sure to click the Keep Open button on the toolbar to ensure the work order doesn’t get lost! From Work Orders Due, double-click the repair item. The repair’s Work Order Details automatically open. To begin tracking the time spent working on the repair, click the play icon next to the Timer field. The timer continues to run when Work Order Details is closed. To end time tracking, click the stop icon next to the Timer field. The Actual Time field automatically updates. Add any additional SKUs and/or Internal Notes. Change Status as needed. Actual Time may also be manually updated. When you’re done, click Save (or Save & Print, if you want a new copy of the ticket). After making any final updates, check Completed, then click Save. 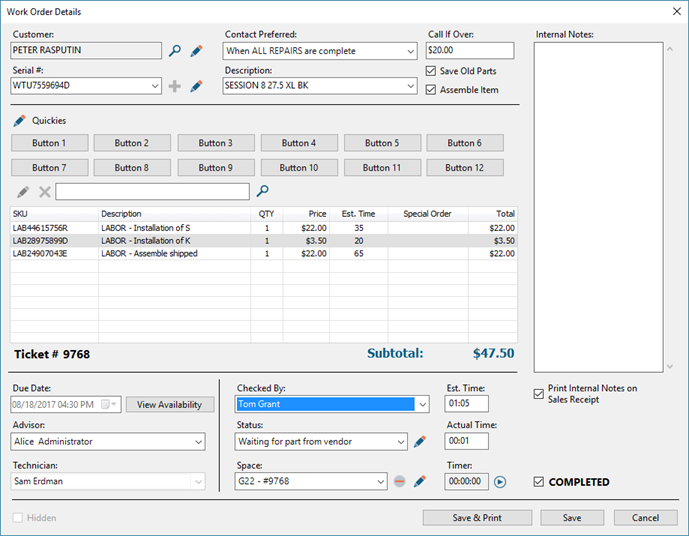 If you’ve selected to automatically notify customers on work order completion, an email and/or SMS (text) message displays to send based on your selection for Contact Preferred. Leave the default text, or enter your own. The transaction remains open until the customer returns to pick up the item(s) and pays in full. Access work orders that are marked Complete but have not yet been finished (closed). On the Ascend Desktop, click the WO Ready tile. 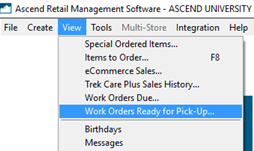 From the Ascend Desktop, select the View menu > Work Orders Ready for Pick-up. 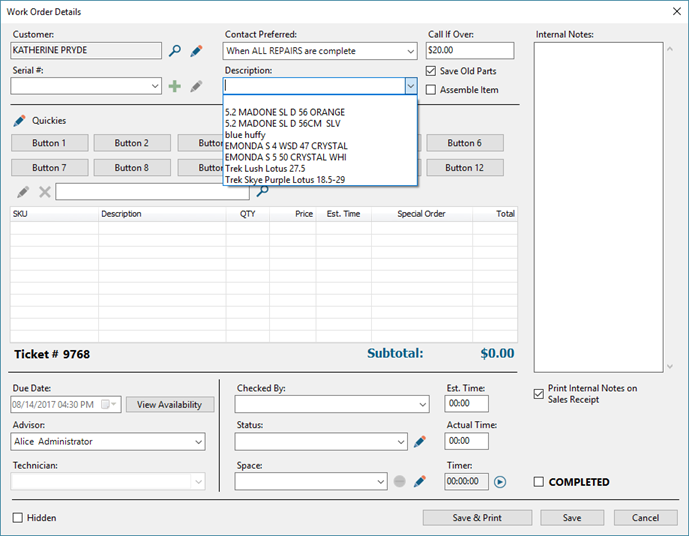 From the Work Orders Due screen, select Ready for Pick-up from the Work Orders drop-down. Double-click the repair item. The repair’s Work Order Details automatically open. If a second user gives the repair item a once-over to ensure nothing was missed, select that user from the Checked By drop-down. When you’re done, click Save. Now you can finish the transaction as normal.